“What is she on about now?” I am sure you are wondering. Well, it is easy–I want you to combine edible flowers in some form or another, with spices in a recipe. You can give us cultural notes about the flower, historical background on its use, your inspiration for why you chose it, or whatever you like in the post. You can tell us how the plant grows, and how you harvested it–however you would like to do that. You also do not -have- to use fresh flowers to fulfill the idea of this challenge. You can use extracts (kewra or rose for example), waters (rosewater or orange-flower water), dried petals or flowers (lavender buds or rose petals), essential oils–in very small amounts (violet or lavender) or preserves (rose petal jelly or gulkand). If you use any of these items, be certain they are food grade, and are from flowers not treated with chemical pesticides. (Frontier and Aura Cacia essential oils are organic, for example.) Do not use rosewater mixed with glycerine, but simply distilled water that has been scented with pure rose oil. The best way to assure that your flower waters are meant to be used not as perfumes but as flavoring agents is to buy them at a grocery store rather than a drugstore. If you use fresh flowers, follow these few simple rules. One, make sure that the flower is truly edible. If in doubt, don’t eat it–there are plenty of books and websites out there about edible flowers. 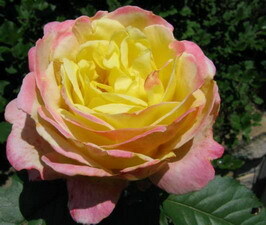 Two, make sure that the flowers are from a grower who doesn’t use chemical pesticides on it. (The best way to assure that is to grow them yourself or to get them from a neighbor or family member. )Three–wash it very well–wee bugs like to hide in the petals of plants and surprise you by appearing on top of your cake right before you serve it. Yes, this has happened to me. Yes, it is embarrassing! Have fun with this one. Be adventurous and creative. Let the flowers be your palette and the scents and flavors your paints for a masterpiece. And, as always, if you have questions, or need help, email me or post here and ask. The entry rules are the same as always–when you make your entry post, leave a link back to this post, (that way, if your readers want, they can come play, too) email me a link to your post, with your name as you want it to appear in my round up along with nationality if it is important to you. (This will also forstall me guessing and getting it wrong again!) The deadline is midnight June 15th, and the roundups will appear in the next couple of days after the deadline. Look for the final round-up post for The Spice is Right II either this evening or tomorrow morning! Note: All of the photographs that are illustrating this post come from the garden at our old house in Pataskala. You can see why we miss the garden so much! WHAT????!!!! How do you come up with these? Glad you like the round-up so far, Ramya–and I am glad you like the next theme. L.G.–well, actually, I cook a lot with flower flavors myself, and I thought, hrm–what would go with June? Flowers! I already have July’s theme and August’s themes set, though the exact name for the Auguest theme I still have to come up with. After that, as my pregnancy advances, we will have to see what happens. I may or may not be as creative with them as I have been, or I may just slack up a bit. But I like seeing everyone get creative and have fun with these events and everyone always learns a lot from the different posts. Great theme, Barbara, and thanks for your considerable efforts in these challenges. Wow…I’m quite sure I wouldn’t have had the energy or inclination when I was expecting! I can’t wait to see what you send me, Ilva! Well this is totally up my alley! oh and I love your flowers. 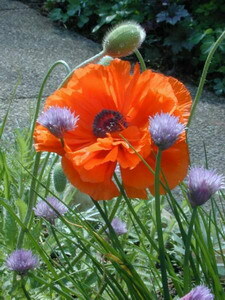 Poppies are one of my favorites. You just don’t make it any easier, do you, Barbara! ;-D I love using flowers as well, although they’re generally just as a garnish. I’m really hoping that we’ll HAVE something that is particularly flavourful flowering in time. This spring has been particularly cold so far. P.S. Have you changed the specifications for the permalink image size from 72×54 to 100×75 pixels? Well, Elizabeth, if you don’t have fresh flowers to use yet, you can always use essences, dried flowers, waters, or preserved flowers and still fulfill the requirements of the challenge! As for the pictures–you don’t have to send me any–if you want to specify which one to use, that is fine, but it is just as simple for me to download them from your site and let the software do the sizing than it is to have them sent to me in email! I want to make gulkand or rose gam. please answer my two points so i can make good quality gulkand . 1. 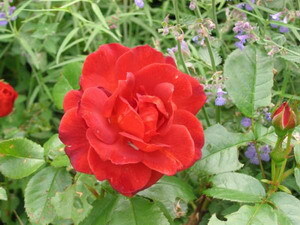 Use dry or fresh leaves of Rose Flowers. 2. Which colour of Rose is better Pink Rose or Red Rose.